On Sunday, the anniversary of 9/11 felt much heavier than usual. Maybe that’s because it was the 15 year anniversary. Maybe it’s because I’ve been down there more these past few years staying with friends who live there. Or maybe it’s because my daughter is at an age where she now knows the events of that day. As is so often the case with traumatic events, we tell the story over and over- at least our small version of the larger story. I tell Audrey how I saw the towers on my bus ride into work right before the Lincoln tunnel- how it was always my signal that I was almost there. I tell her how by the time I walked to my building on 45th Street, the first plane had crashed and co-workers had the image up on their computer screens. Still, my friend and I went down to the 7th floor to get bagels for breakfast, ignorant to what was already unfolding. Back upstairs, the second plane had hit. By then we all knew. A voicemail on my phone from my dad asking if I was OK, sounding choked up at the end of his message, confirmed how bad it was. “When I heard grandpa’s voice, I knew it was unlike anything that had ever happened during my lifetime,” I tell her. I tell her about how I met her dad at his office where we could look out his window and clearly see the smoking towers downtown, and how we wandered around trying to catch a cab uptown to his apartment with two of our co-workers, how there was no cell service, no subways, buses, or trains running, and yet how people walked around for the most part like it was an ordinary day which made it even more surreal. We looked at a book my company, Random House, had made memorializing the towers and given out to all employees. Inside are pictures of the construction and the history. 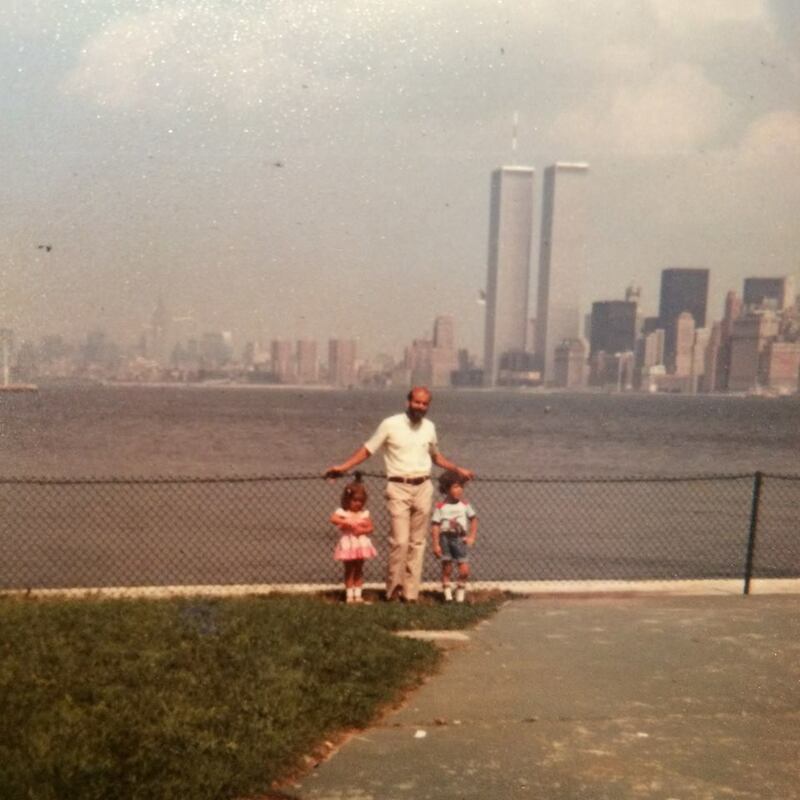 I take out two other photo albums and find a picture of me as a two or three-year-old with my dad and brother, the towers in the background. In another album is a picture of me taken by Dan with the towers straight above me. I don’t tell her all of this to traumatize her, but because I think she is old enough to understand this simplified version, and because I promised then I would never forget, and I will not always be here to remember. She’s been down to the reflecting pools and she knows those giant footprints are where the Towers stood. She imagines that the Towers fell the way blocks do, sideways, and asks me about the other nearby buildings and how they survived. I try to explain how they collapsed in and on themselves. Then she asks, “But wait, if the people flying the plane knew they would die too, why would they still do that?” What she’s really asking is “How could someone’s hatred surpass their love of life? Their own life?” Seven-year olds know the value of life. She is eager to wake up every morning, and hates going to sleep each night because she feels like she’s missing out on life. Later, before church, I turn on the television and we listen for just a bit to the reading of the names. I can think of no better way to honor those who lost their lives than this reading of the names interrupted only by the ringing bell and moments of silence marking each plane’s impact and the falling of the Towers, as well as the plane hitting the Pentagon, and the field in Pennsylvania. When I hear each name, first, middle, last, I imagine a parent naming their newborn, listening to the sound of its cadence. I keep a list of people I am praying for and I try to go through it each morning. If I tell someone I am praying for them, I want to mean it, but those prayers aren’t usually lengthy. Quite often, they are simply the names read aloud with short pauses in between, very similar to the reading at the 9/11 service. I’m a lover of words, but these names embraced on either side by silence, like an offering in my outstretched palms, often feels more powerful than all of my finest words. I hear that morning from the newscasters that there was some discussion of not proceeding with the naming this year and going forward, but I’m glad they did. When we come back from church 2-1/2 hours later, I turn on the TV again. “They’re still reading those?” Audrey says with astonishment. “Yes, they are,” is all I can say. Also a lover of words and a Believer, I thank you for that beautifully written article. I was feeling especially heavy this year as well. I was just a few blocks away on 42nd in my office in the Viacom building. I saw the images on a giant TV on my walk to work. We all looked up, me and these strangers, and we asked each other what was going on. No one knew the magnitude yet, the second plane hit when I was at work on the phone with my mom. It was her voice, her worry, that made it real to me. I haven’t explained 9/11 to my daughter yet. She has pretty intense anxiety and worries a lot about illness and death so I’m waiting, but I know next year I’ll have to. It’s always so funny how we’ve led somewhat parallel lives! Didn’t we both later work in the flatiron district or around Madison Square Park or am I dreaming that? And bought our daughters the same necklace from the Clay Pot? 🙂 Interesting that it was your mom’s voice (my dad’s) that let you know how serious it was. Definitely wait until you feel the time is right. I’m not sure why I chose to tell Audrey this year. I think like I said, just because we’d been down there a lot the past couple of years. Her Brownie troop led the pledge of allegiance at a memorial in our town dedicating a piece of steel from the towers so it also felt important to give her context before we attended. I did reiterate to her that nothing like that has happened in 15 years and how lots of people are keeping us safe. That part seems really important- esp. for an anxious child. This is really beautiful, Julia. Heartbreaking and heartwarming and quiet and strong.